Cherry Hill natives and friends since attending Cherry Hill High School West, Kate Nanni Sullivan (left) and Sarah DuVall Pearson (right) take a break from choreography for the song “Supercalifragilisticexpialidocious” from the Mary Poppins musical, at Resurrection Catholic School, on Feb. 1. Supercalifragilisticexpialidocious. Just as hard to write, as it is to read and pronounce, and twice as hard to try and sing and dance to if you’re a middle-school-aged actor. Enter Kate Nanni Sullivan to the rescue. 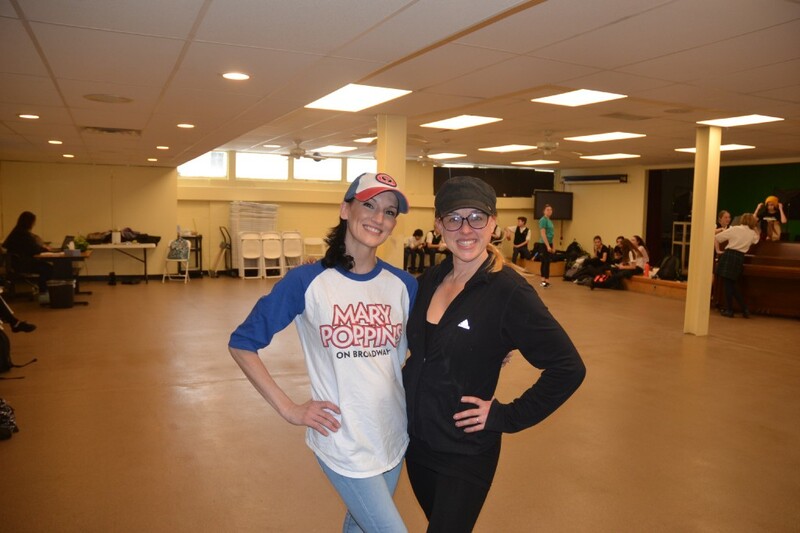 The Cherry Hill native, who spent seven years on Broadway in the musical version “Mary Poppins,” stopped by Resurrection Catholic School on a snowy Feb. 1 to help her friend Sarah DuVall Pearson choreograph a particularly challenging section of the musical. In the school art room, Nanni Sullivan along with DuVall Pearson, were hard at work instructing approximately 30 middle-schoolers through the steps and body motions that accompany this complex set piece that is one of the highlights of the film — first released in 1964 — and the musical, which made its debut at London’s West End in 2004. “I grew up and trained in this area, at the Pennsylvania Ballet and with my mentor who now is the Philadelphia Eagles cheerleading coach. I graduated from (Cherry Hill High School) West in 1995. I was undecided on where I wanted to take my career because I loved ballet so much and I equally loved musical theater. And it was a very stressful thing as a kid, to choose for college. So I went for my ballet career first,” Nanni Sullivan explained during a break in rehearsal. That run lasted from 2006 to 2013. Nanni Sullivan described the time she spent with the show as a dream come true. She added that performing in one show for all that time never got tired or stale for her, because the frequent cast turnover — and in some cases cast returning — meant some aspect of the performance was always fresh and interesting for her. Having a crack at the show in her early days also might have had something to do with it. “I went to the Bowman School of Dance in Cherry Hill for my younger years of dance, and I’ll never forget we did (‘Mary Poppins’) chimney sweeps for our recital. And then, there I was on Broadway as a sweep in that show. My heart connected to it so much,” she said. Nanni Sullivan had to reach back to her formative years to successfully translate complex material. She believes young minds, whether in a dance class or learning choreography, are a muscle that needs work and must grow as much as stamina as a dancer and singer. 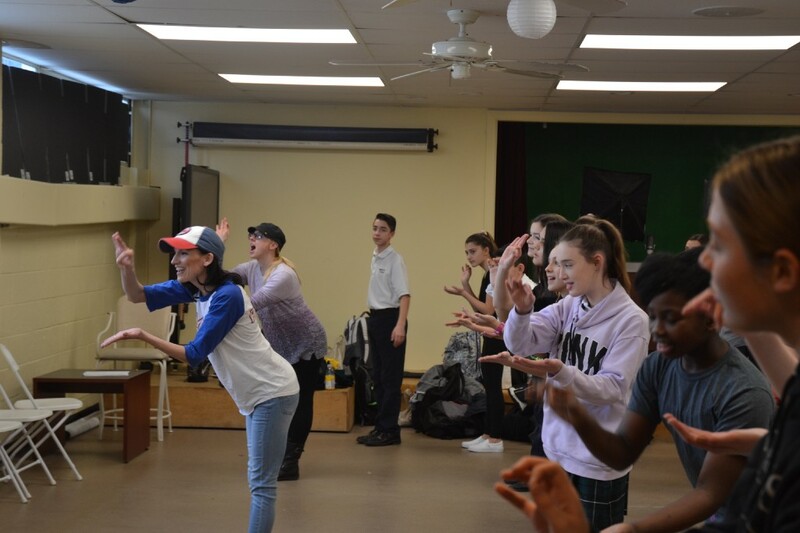 Kate Nanni Sullivan (front left) and Sarah DuVall Pearson (front right) instructing young actors from Resurrection Catholic School in choreography for the song “Supercalifragilisticexpialidocious” from the Mary Poppins musical, on Feb. 1. She also noted how challenging it was to retain all that at a similar age, and said how impressed she was with how quickly the actors were able to process the step-by-step instructions and incorporate them into a whole in such a short time period. “I was blown away by this group. It was very special. I remember what it was like to be a student and I remember how stressful it can be. I make sure to teach them, in addition to the material for ‘Mary Poppins,’ how to practice. I give them skills so they’re not overwhelmed, so they understand that they’re not going to nail it here in the first rehearsal. I want them to not be discouraged because it’s so overwhelming,” Nanni Sullivan said. A spoonful of sugar, indeed. Mary Poppins will play at Christ Our Light Parish Center at Resurrection Catholic School on Thursday, March 21 and Friday, March 22 at 7 p.m., then Saturday, March 23 at 1 p.m. Tickets are $5 for adults, $3 for children and can be purchased at the door.